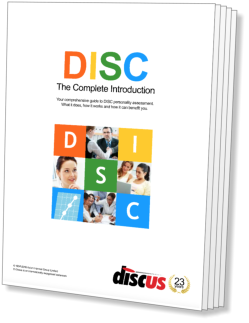 The 'S' of DISC stands for Steadiness, a factor relating to a person's natural pace, and their reactions to change. 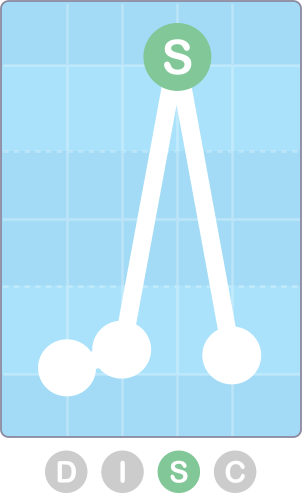 The Steadiness factor is shown third from the left on a standard DISC graph, following Dominance and Influence. The third of the four DISC factors relates to a comparatively reticent and careful type of person. Compared to Dominance or Influence, a person whose major factor is Steadiness will tend to be far less open or direct. They'll more usually respond to events, rather than take pro-active steps themselves. The Style Card shows a Steady person as being high in Openness, but low in Assertiveness (which we term Receptive). This describes the core of the Steadiness factor: a concern for other people, combined with a reluctance to take direct action. 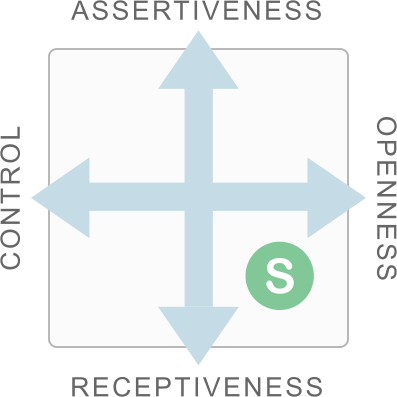 Steadiness lies in the bottom-right quadrant of the Style Card, where Receptiveness meets Openness. As the name implies, Steady people are consistent and reliable in their approach. Indeed, they prefer to operate in situations that follow established patterns, and to avoid unplanned developments. Because of this, people with high Steadiness tend to be quite resistant to change, and will take time to adapt to new situations. Where Steadiness is low, the profile reflects a person with a quite different attitude. Low-S individuals are eager to act and impatient for results, and rarely show the patience or consideration associated with a High-S. Far from resisting change, people with low Steadiness enjoy variety and innovation, giving them a much more flexible outlook than those with high Steadiness. As such, they're ready to take on new challenges and explore new experiences. A High-S will be best suited to roles where their natural advantages can come to the fore: situations where patient, reliable work is needed. A consistent working environment is ideal for a person like this, with minimal distractions or unplanned events. The strengths of a highly Steady type of person - patience, reliability, consistency - make them particularly well suited to administrative work. They have the capacity to apply themselves to work like this and focus on its needs in a productive way. Work like this can often lack variety, but while many types would not find such a prospect motivating, it fits neatly with a High-S's preferences. High Steadiness also relates to an level of openness to other people, so roles that involve providing support or help to others can work well for a person of this kind. This is a broad area covering a wide range of potential work. At a practical level, High-S's will often be suited to technical support or customer service work. On a more personal level, their understanding and patient approach means that they can be successful providing personal support or counselling. Like all the factors, there are situations in which a High-S will thrive, and others in which they will struggle to succeed. In this section, we'll take a brief look at some examples of each. Operating within a well-planned project is an area where a highly Steady type of person will often feel at their most comfortable and motivated. Working consistently with others towards a prearranged goal is a preferred working method for somebody of this kind. This will tend to be less true, however, in situations where deadlines are close, or the plan needs to adapt to changing circumstances. A highly Steady type of person can be an effective leader and, indeed, so can any style, under the right circumstances. Steady leaders will tend to work best where leadership involves organising other people within a relatively predictable and stress-free environment, where there's little need for urgent action or dynamic decision-making. A defining characteristic of a High-S type of person is a natural distrust of novelty. People like this will tend to avoid change simply because it involves adapting to the new and the different. Where change is inevitable, a person like this will eventually adapt to a new status quo, but it will take time for them to acclimatise themselves to their new conditions. Patience: High-S's will tend to wait for events to unfold and respond as needed, rather than taking direct action of their own. Persistence: Once embarked on a course of action, a person like this will focus on their task and work persistently towards its conclusion. Determination: High-S personalities focus intently on a task, and can be remarkably resolute in concentrating on a project. Openness: Steadiness also has a social side, and people with this factor are open to building positive relations with other people. Consideration: The 'S' factor relates to people who tend to think about the consequences of their actions, especially on those around them.